GVS Construction Corp. is a professional tile installation company founded in 2004 by two Europeans, Egis and Yuriy. 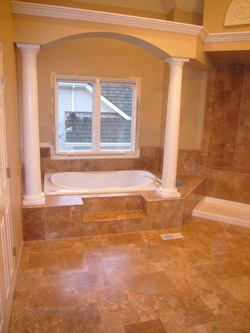 Our specialization is custom tile design and installation. During this time we have collected hundreds of satisfied customers who highly recommended us as their professional tile contractor, to friends, neighbors and relatives. We stand by the saying that the best advertising is a satisfied customer. Every customer and every tile renovation project we take on is handled with the utmost importance. Our goal is to keep every client satisfied by doing professional work from the beginning of the job to the end. Whether your creative idea is a marble powder room floor, a master walk-in shower crafted in glass, tile kitchen back splash or a custom stone fireplace, GVS Construction Corp. is the choice for you. Each of our customers are be treated with equal importance and receive top-notch tile work that can add beauty to your home or business. GVS Construction Corp. provides custom tile design and professional tile and stone installation to Naperville, Aurora, Geneva, Batavia, Saint Charles, Wheaton, Winfield and Glen Ellyn, IL as well as the surrounding areas.